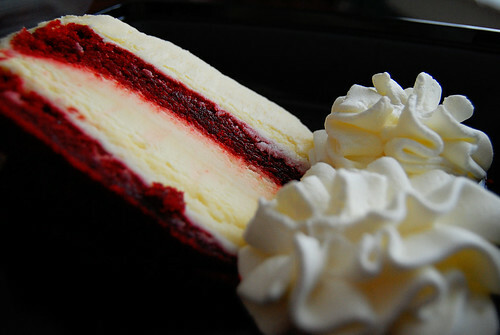 This weekend, I met and fell in love with this Red Velvet Cheesecake from The Cheesecake Factory. Sidebar: I ate it for breakfast the next morning. Before arriving at The Factory, I stopped to buy some reading material at Books-A-Million. Because my shelves could really use more books. I have a problem. As I made my way to the front with three new publications, an adorable cashier in his early twenties came to check me out. Faux-hawk: Hi. How are you? Faux-hawk: Umm... Well... I'd be lying if I said I was okay. INSIDE JAMIE: When I asked "How are you?" dude - that was actually rhetorical. Faux-hawk: Umm... no... It's women. INSIDE JAMIE: Ugh. There's cheesecake waiting to marry me. Me: Well, we can be tough on guys. Faux-hawk: My girlfriend broke up with me. INSIDE JAMIE: Ring it up. Ring it up. Ring it up. Do it now. Faux-hawk: I really loved her. INSIDE JAMIE: Just nod sadly. And shake your keys. That's a lot of information of an unnecessary variety. Obviously - the guy had it coming. S: Really. It was too much for a such a quick shopping trip. I don't really have a comment for the conversation except for "Wow" but that cheesecake looks amazing!! BR: If only he were a girl lesbian, then it might have worked out between him and her. O: I feel the same way about cheesecake.